90 Wednesday August 4th 1875. Emma and I went to town early this morning. I did considerable running around town. I took Henry Sacketts valise over this morning he will not board here any more. I got a handsome present this morning from Henry Gilbert. A cast looking-glass case. We got dinner after we came home and in the afternoon I cut up some old wrappers into aprons. Uncle Jim Anderson was here in the afternoon. He did not stay long. And gave me the babys picture. We had a letter from the folks today and Mother insists that she is going to start home next Saturday. I wrote her this afternoon. We had quite a heavy shower this afternoon. 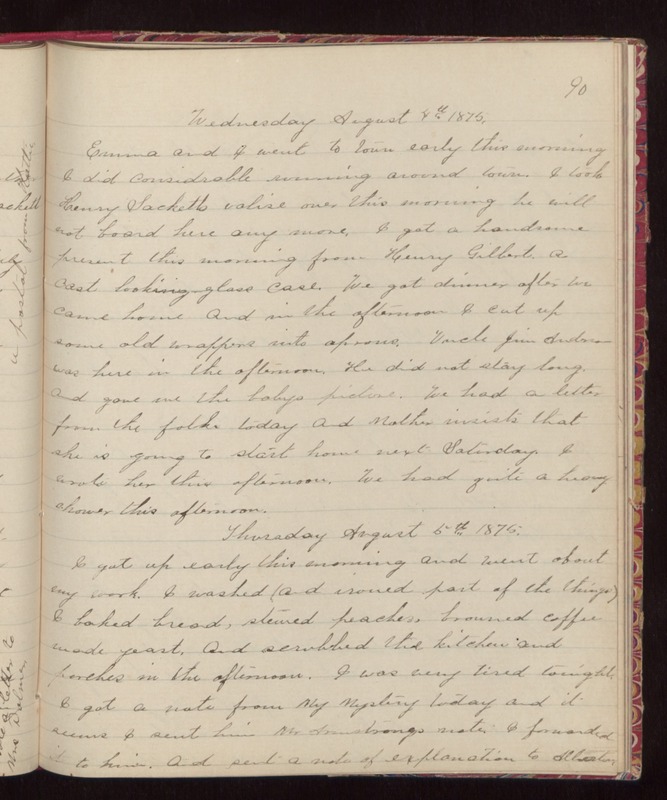 Thursday August 6th 1875. I got up early this morning and went about my work. I washed (and ironed part of the things) I baked bread, stewed peaches, browned coffee made yeast. And scrubbed the kitchen and porches in the afternoon. I was very tired tonight. I got a note from My Mystery today and it seems I sent him Mr Armstrongs note. I forwarded it to him. And sent a note of explanation to Allerton.